How to Get Notified about a new Google Doodle Game? Home > News > How to Get Notified about a new Google Doodle Game? Google has started this new trend of launching short addictive games on special occasions. These games are called Google Doodle games. The games are launched on celebration of special events. For example Google launched a series of short Google Doodle Games during the Rio Olympic games 2016. The craze for these games are huge but since the games are seasonal or rather say occasional we often miss out the games. Hence, Google has added a new option in its Settings that will help you know bout every Google Doodle game that makes its appearance. It’s the notifications. 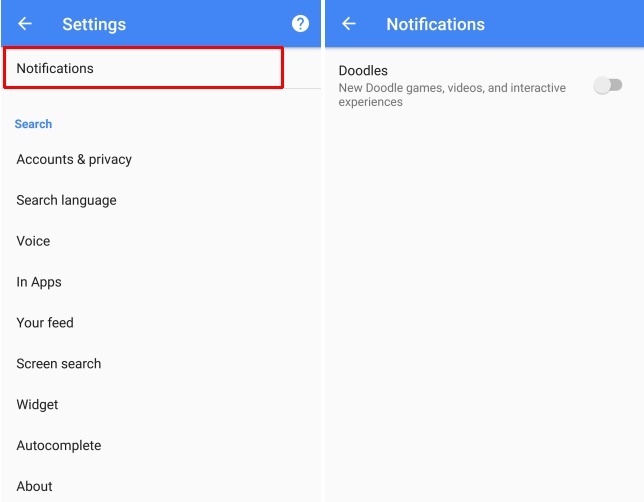 You can now turn on Notifications for Google Doodle and it can be done straight from the Settings of Google App. Follow the steps below and enable your Google Doodle game notifications. 1. First of all, make sure you have the latest version of Google App installed in your Android phone. 2. Now tap on the hamburger (three dash stacked) icon located at the top left corner, to open the Settings of the App. 3. Now go to ‘Settings’ in the navigation drawer. 4. Find out the ‘Notifications’ option on the Settings menu. Tap on it to turn on the ‘Doodles’ option. These notifications are only available on the Android version of the Google app, for now. We hope it will be made available for iOS soon.